The Quehanna Trail (QT) is a long-distance loop trail in Moshannon and Elk State Forests. Blue-blazed connector trails in the western and eastern sections of the main loop allow shorter but still extensive backpacking loops. (Camping permits are required.) A number of blue-blazed cross-country ski trails in Quehanna Wild Area intersect the eastern part of the QT loop and also can be used to fashion shorter circuit hikes. A spur trail called Old Sinnemahoning Road, a gated jeep road, connects the QT to the Donut Hole Trail and Bucktail Path near Sinnemahoning. Six parking lots are available for trail users: at Parker Dam State Park, forest foreman headquarters on Deible Road near Quehanna Highway, the Game Commission parking lot at the junction of Ardell and Merrill Roads, Marion Brooks Natural Area, the former forestry barn location on Wykoff Run Road, and on Quehanna Highway about a mile north of Piper. 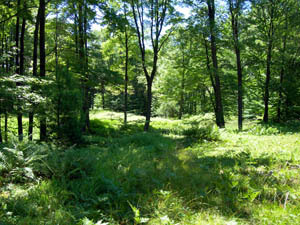 The southern part of the Quehanna Plateau is a mostly oak-laurel ecosystem; the northern part is characterized by northern hardwoods mixed with hemlock and pine. Several of the QT connecting trails pass through State Game Land 34, featuring ponds that attract waterfowl. Feed plots and viewing platforms have been constructed throughout the whole Quehanna Plateau area, in order to satisfy public interest in viewing elk that have wandered south from their traditional stomping grounds north of Sinnemahoning Creek. The elk now can be found throughout the Quehanna area, but at such a low density that you are only occasionally rewarded with a sighting. The elk move easily through the forest, and a rare sighting is certainly a thrilling experience. Part of the Quehanna Trail passes through the 50,000-acre Quehanna Wild Area. This is the largest wild area in the state, though it is traversed by two paved and several unpaved roads. The wild area is known for its beautiful streams and unusual open savannas with occasional black cherry trees that were apparently left when the area’s vast hemlock forest was logged in the nineteenth century. Two natural areas feature stands of paper birch, near the southernmost limit of that tree’s range. Quehanna Wild Area was designated after the termination of industrial activities in the 1950s and 1960s in the southeast corner of the area, near Piper. In an ill-advised attempt to increase area employment, the state brought in a technology firm to conduct military research and development in the wilderness. This enterprise failed, as did later private industrial activities. One side effect was industrial and low-level nuclear contamination at numerous dump sites in what is now the wild area. These sites all have been examined by the Pennsylvania Department of Environmental Protection and judged harmless to outdoor recreation enthusiasts. More recently, the former industrial complex at Piper became home to a PennDOT training facility and a low-security prison boot camp. The Quehanna Trail was rerouted to give the boot camp a wide berth. A seven-day backpacking trip on the entire QT main loop is described in 50 Hikes in Central Pennsylvania (2001), by Tom Thwaites. Greate Buffaloe Swamp (2001), by Ralph Seeley, combines a detailed trail guide with a historical narrative for the Quehanna Plateau. Use the above trail updates in conjunction with the information in these publications. You also can discuss trail conditions with Ralph Seeley or George Lockey via the contact information given on the website. Ben Cramer has written a Guide to the Quehanna Trail in the PAHikes Trail Guide Series, published 2015. It is available in KTA's Bookstore.